CNBC just showed a special on Costco so of course I can’t get the warehouse store out of my mind. I love Costco. However my love doesn’t ignite a fire hot enough to make me buckle down and pay the membership fee. Like a first class moocher I have relied on friends and family to get me through the doors of the place for years. Perhaps now that I am in South Carolina, with no family and no friends as of yet, I might make the sacrifice and purchase a membership. You see, there are some items I really like at Costco. For this blog post I want to give you the five items I purchase the most at Costco. So without any more chatter let me give you my list in no particular order. Muffins: About once every two months I will do the mix and match deal where you get to pick two packs of six muffins each in the bakery. I always go chocolate for one of the packs and then either apple crumb, banana nut, or blueberry for the second six. I freeze them at my place and then for two weeks I will wake up looking forward to breakfast! I will take one out of the freezer, throw it in the microwave for 20 seconds to unthaw it just a little, and then eat it relatively cold. BONUS: Down south they have a different flavor of muffin you can’t get out west…corn muffins!! Yes, the jumbo Costco sized muffins also come in the corn variety. 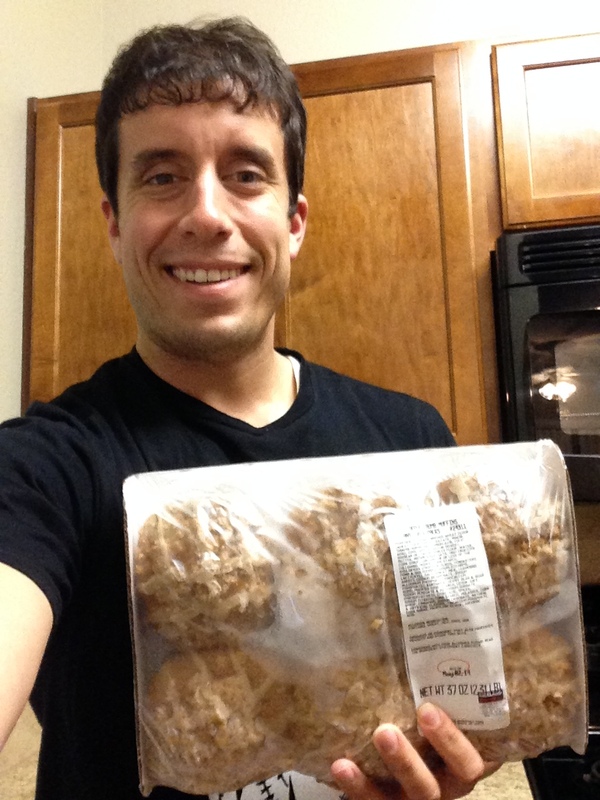 Me with some frozen Apple Crumb Costco muffins. Cheese: Costco sells a cheese variety pack that is awesome. They put two pounds of thickly cut squares of cheese into plastic wrapping, a perfect snack item. Many times I will add some squares of cheese to my dinner or when I take a rare break from peanut butter I will layer my sandwiches with the cheese slices. 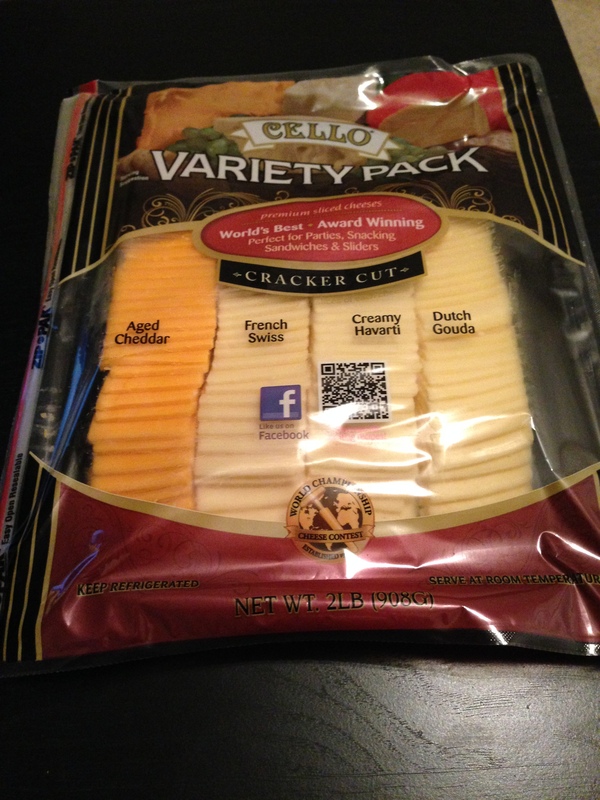 The variety pack includes French swiss, creamy harvard, Dutch gouda, and my personal favorite…aged cheddar. This is the cheese pack that Costco sells. Pub Mix: Costco offers a snack mix that I can’t stop eating once I start. I don’t know how to describe the pieces that make up the mix because they are kind of obscure but pretzels are included…and then you got about four other heavily salted items. I started to chow down on this stuff when we would hold basketball tournaments at Montana. In our hospitality room we would always have a tub and my obsession started. Philly Cheesesteak Sandwiches: In western Costcos they sold a microwavable cheesesteak sub. A box contained six sandwiches and if you happened to put a little Sriracha on it you had something pretty special. I would buy a box and have a sandwich for lunch on the weekend. When I visited the Myrtle Beach Costco I couldn’t find my beloved philly cheesesteak subs but I opted for the BBQ beef steak sandwiches (coincidentally an item I never saw out west). The Philly Cheesesteak sandwiches from the west turned into Beef Steak sandwiches in the east. Hot Dogs from the Food Stand: It doesn’t matter if you are on the west coast, east coast, or no coast you will always find Costco’s signature hot dog at the store’s food stand. Oversized, tasty, and only $1.50 with a drink included you really can’t beat it. I have ate Costco dogs from when I was a little kid up until now and next time I go to Costco I am sure I will order another one. The only way I am getting back to Costco anytime soon is if I bite the bullet and invest in a membership. With a store only five minutes from my place I think I am going in that direction. I just hope that particular Costco can pick up its samples game because it was pretty weak a few days ago. Don’t Blink. 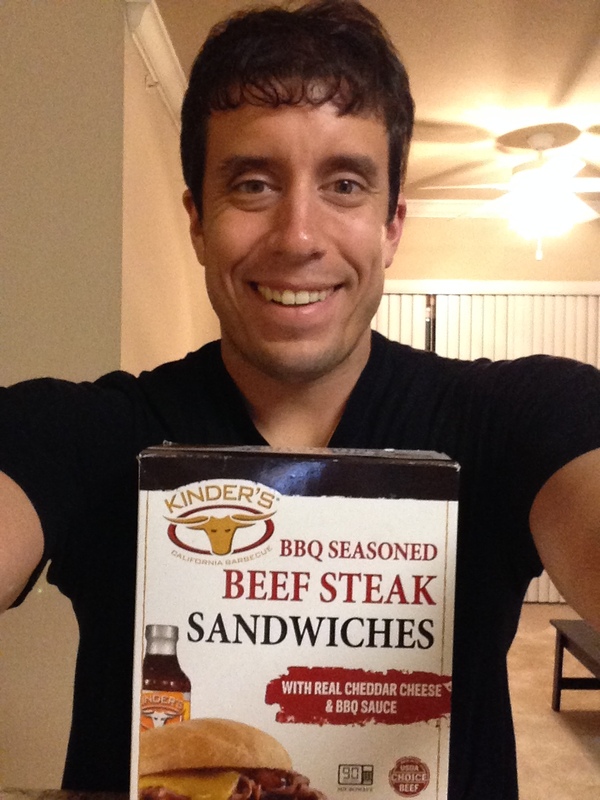 This entry was posted in Uncategorized and tagged Costco, Costco Hot Dogs, Pub Mix by brent. Bookmark the permalink.